Ease of use: Pandle is the easiest to use of all the accounting software packages available. This is partly because it is a very basic system and partly because it has been well thought through. The design of the site and the software is pretty good and navigating around is very fast and very easy. Pandle also has a set up wizard that asks for a lot of the business’s details so that when the software loads there are no settings to fill in. This is useful as a lot of accounting software packages will not do this meaning the user may enter transactions before sorting out the VAT settings for example, resulting in incorrect VAT returns and so on. Entering opening balances was also very straight forward. There was also a help screen at the bottom of the page which explained what was required on screen along with definitions of any jargon on the screen at the time. Pandle is also made for the UK so the terminology is UK specific as well as the layout and business types etc. Speed: Very fast! The site does not have any lag and transactions are able to be entered really fast. Shortcut keys are available for even speedier entry and all types of transactions are entered from just 2 tables minimising the navigation. The only downside is that it does not have bank feeds/imports. Features: Pandle does not have many features at all but that’s mainly because it was not designed to. It is for basic users who want the simplest accounting software available. Support: Telephone and email support is available. It also has an onscreen help bar which gives the relevant help depending on what screen the user is looking at. There is a simple user guide but unfortunately no videos or webinar. Reporting: The reporting is very basic but intentionally so. It has 3 reports, a profit and loss, a balance sheet and a trial balance. The VAT return/report was very good and proper explanations of how all the figures were made up. Price: Pandle is free for the foreseeable future. They say that a pro version will be introduced later, which they may charge for. VAT Handling: For a small player we were very surprised how well VAT was handled, we couldn’t actually fault it. It handles cash accounting and the flat rate scheme and the switch between cash and accruals perfectly. It also takes care of the 1% discount on the flat rate scheme and reclaiming VAT on assets over £2,000. 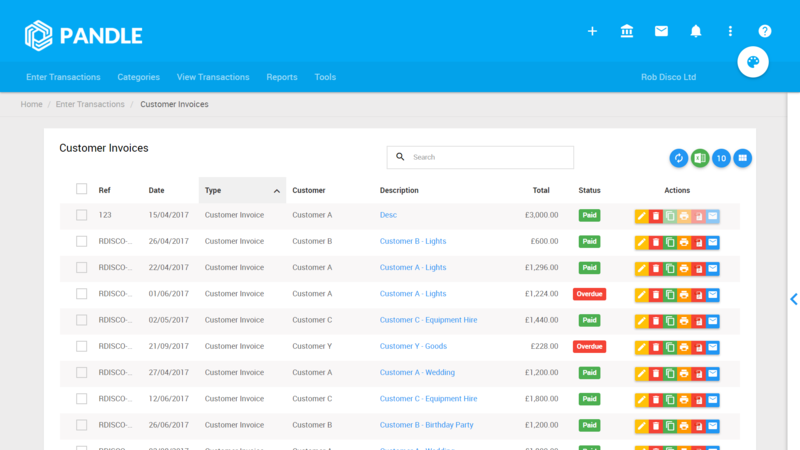 Pandle also breaks down the VAT of the outstanding invoices (when entering the opening balances) so that it knows the VAT treatment for the payments when made. 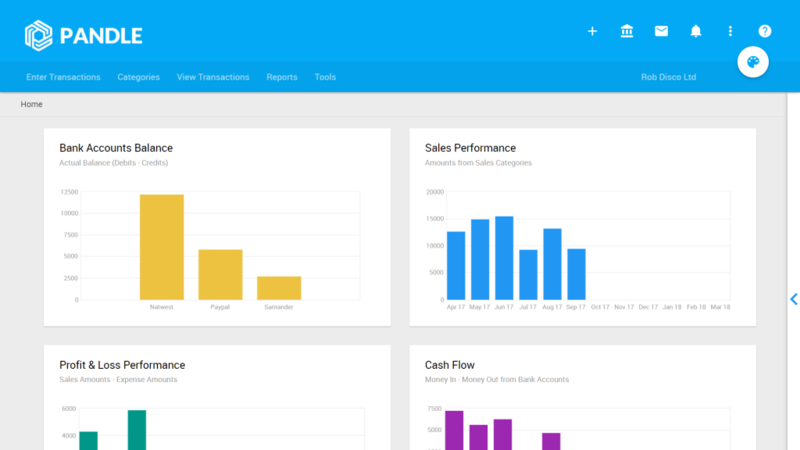 This was the best accounting software for VAT handling we have seen so far. The bits we liked: We particularly liked the set up wizard, easy opening balances and how quick everything was. The shortcut keys were also a good unique feature which we struggled to find elsewhere. It was the only accounting software we used that did not require the user to use the mouse when entering transactions. The bits we didn’t like: The lack of features would be a draw back for some users and also the lack of reports. Anyone could use Pandle, even without any prior bookkeeping experience. For novice users it would be worth investing 15 minutes to read the getting started guide as it explains the software inside out. We actually think professionals and bookkeepers would use this as well for their clients if they are basic businesses as the speed is second to none.